There are 2 ferry routes operating between Rangitoto Island and New Zealand offering you combined total of 37 sailings per week. Fullers Ferry operates 2 routes, Rangitoto to Auckland runs 3 times per day & Rangitoto to Devonport (Auckland) about 16 times weekly. As the frequency and duration of crossings on some routes varies we would advise that you do a live search for crossings from Rangitoto Island to New Zealand to get the most up to date information. 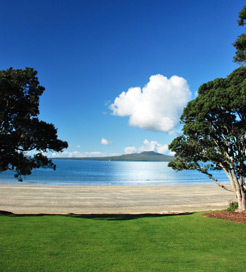 Rangitoto Island is the youngest volcano in New Zealand, situated to the north-east of Auckland in the Hauraki Gulf. Emerging from the ocean just 600 years ago, Rangitoto now offers fantastic hiking trails through lush vegetation reaching 259 metres high. The island is home to the largest pohutukawa forest in the world as well, a large tree renowned for producing vibrantly coloured red leaves. As a pest-free environment, Rangitoto is also the habitat for a wide range of rare birds including tieke, saddleback and kakariki, making it a brilliant destination for birdwatchers. Rangitoto Island makes a great day trip from Auckland, so there are frequent sailings every day back to Auckland Harbour and Devonport, a suburb north of the city centre. The ferries depart from the eastern tip on the coast facing Islington Bay and the neighbouring Motutapu Island. New Zealand is a small country, similar in size to Great Britain or Japan. With a population of only four million people it’s gloriously un-crowded and many areas are sparsely settled. Consisting of two main islands - imaginatively named North Island and South Island and many smaller islands in the South Pacific Ocean, the archipelago lies roughly 1,000 miles south east of Australia. New Zealand has a temperate climate. Winters are fairly cold in the south of the South Island but mild in the north of the North Island. Known by some as "The Shaky Isles" because of frequent seismic activity, lying on the margin of the two colliding tectonic plates (the Pacific and Indo-Australian), earthquakes are common, particularly in the south west of the South Island and in the central North Island. 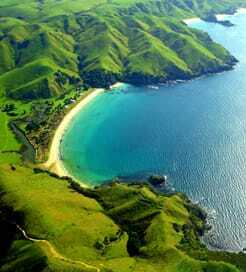 As a result, the North Island's scenery is marked by several active and dormant volcanic cones. Wellington is the capital of New Zealand. The Windy City is built on the foreshore of Wellington Harbour and ringed by mountains, providing the scenic home of many of New Zealand's national arts and cultural attractions.